The Soviet Union tests its first atomic bomb to become the world's second nuclear power. The RDS-1 (Russian: РДС-1), was the Soviet Union's first nuclear weapon test. It is also known as Joe-1, in reference to Joseph Stalin. It was test-exploded on 29 August 1949, at Semipalatinsk, Kazakhstan. The RDS-1 explosion yielded 22 kilotons of TNT, similar to the American Gadget and Fat Man bombs. 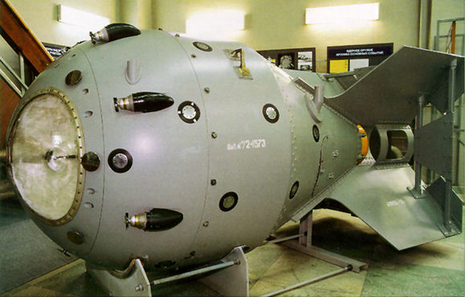 At Lavrenty Beria's insistence, the RDS-1 bomb was designed after the Fat Man bomb dropped on Nagasaki, Japan. The Soviets called it First Lightning (Первая молния, Pervaya molniya), and its development was facilitated by espionage. The Soviets' extensive Manhattan Project knowledge came from spies such as Klaus Fuchs, Donald Maclean, Julius Rosenberg, and Ethel Rosenberg amongst others. There are several explanations for the USSR code-name of RDS-1, usually an arbitrary designation; a backronym "Stalin's Rocket Engine" (Реактивный двигатель Сталина, Reaktivnyi Dvigatel Stalina), or "Russia does it herself" (Россия делает сама, Rossiya Delayet Sama). Later weapons were designated RDS, with different model numbers. The most significant early work on fission in the Soviet Union was performed by Yakov Zel'dovich and Yuli Khariton who published a series of papers in 1939-41 that laid the groundwork for later Soviet atomic weapons development. The Soviet weapons program proper began in 1943 during World War II, under the leadership of physicist Igor Vasilievich Kurchatov. The program was initiated by reports collected by Soviet intelligence about the rapidly growing Manhattan Project in the U.S. It remained largely an intelligence operation until the end of the war, but it was a highly successful one, due to sympathies of many for the wartime Soviet Union fighting Nazi Germany; the socialist political sympathies of some; and the weak security screening program necessitated by the hasty assembly of the vast program. Klaus Fuchs, an important physicist at Los Alamos, was by far the most valuable contributor of atomic information. Annotated bibliography on the Russian nuclear program from the Alsos Digital Library for Nuclear Issues.